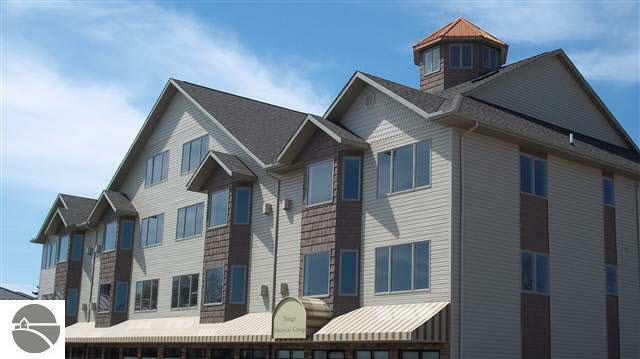 Quality Construction with Views of Lake Huron and the Tawas River. Features a great location across from Town Square Park with a Fabulous Beach on Tawas Bay. Elevator Access. Beautifully finished from top to bottom. This ranch style 2nd level condo gives you space to sit, relax and look at Tawas River or Lake Huron. You will also find an extra storage unit ( 7 x 7 ) off the deck. The master bedroom has it's own private bath and walk in closet. The second bedroom adjoins the main bathroom, while the den or potential third bedroom has glass French doors. All the bathrooms have tile floors along with the kitchen and laundry room, while all the counter tops are granite. The kitchen, dining area and living room have an open floor plan, with a natural gas stone fireplace in the corner of the living room. Waterfront: River, Yes, 200 Ft.